In the present research, the dipole moment, electronic structure, frontier orbitals energy, and aromaticity in the graphyne and Si-doped graphynes were studied with M062X quantum chemical computation. The relative energies of four possible isomers of Si-doped graphyne were calculated. Also, the ionization potential (IP) and electron affinity (EA) values of the studied molecules were reported. Frontier orbital (HOMO-LUMO) gap values were used for illustration of conductivity of these molecules. Aromaticity of the cycles of studied molecules was investigated by nucleus independent chemical shift (NICS) values and electron localization function (ELF). Graphyne which is a newkind of artificial carbon allotropes is correlated to graphite/graphene. The special structures and attractive optical, electronic and mechanical properties have been explored. Graphyne was first depicted in 1987 , while, in spite of numerous attempts, graphyne has not yet been prepared [2-5].Theoretical researches excited attempts for synthesis of graphyne layers, crystals, and nanostructures. Graphyne compounds were synthesized by the polymerization of molecules having carbon cage fragments that are similar to the corresponding structure type of graphyne[6,7]. In this regard, theoretical calculations of the structures of graphyne layer fragments and single graphyne layers and their properties were reported [8-15]. The major aim of the present investigation is to clarify the Si-doping on the structure and properties of graphyne by the quantum mechanics method. The dipole moment, structural parameters, frontier orbital energies and aromaticity of these molecules were explored. All calculations were carried out using Gaussian 09 suite program . The calculations of systems contain C, Si and H described by the standard 6-311G(d,p) basis set. Geometry optimization was performed utilized by the hybrid meta exchange-correlation functional of Truhlar and Zhao (M06-2X) .A vibrational analysis was performed at each stationary point which confirmed its identity as an energy minimum. After optimization of the studied molecules, single point calculations were carried out at the MP2/6-311G(d,p) [18-22] and wB97XD/6-311G(d,p) [23, 24] levels of theory.Chemical shift values are calculated using Gauge independent atomic orbital (GIAO) method at the same method and basis sets of optimization . The topological analysis of the ELF was made using the Multiwfn 3.3.5  at the M062X/6-311G(d,p) level of theory. Figure 1 presents the structures and numbering schemes of atoms ingarphyne andisomers of Si-doped graphynes. The absolute energies and relative energies of these molecules are listed in Table 1. As shown in Table 1, the III-isomer is the most stable isomer of Si-doped graphynes. IV-isomer in the planar form has one imaginary frequency which exhibits a bending vibration of out-plane for Si atom. Therefore, the stable form of this isomer deviates from planarity, changes to non-planar form and also changes the Cs symmetry of isomer to C1. Table 1. Energy (E, in a.u) and relative energy (DE, kcal/mol) of graphyne and Si-doped graphyne isomers at the determined levels of theory. a optimization at the M062X/6-311G(d,p) level of theory. Moreover, the results of single point calculations at the MP2/6-311G(d,p) and wb97xd/6-311G(d,p) levels of theory of optimized studied molecules show that the III-isomer is the most stable isomer of Si-doped graphynes. Fig.1. The structures of graphyne and Si-doped graphyne isomers in this study. Polarizability which describes the response of a system in an applied electric field determines not only the strength of molecular interactions (such as the long range intermolecular induction, dispersion forces, etc.) and the cross sections of different scattering and collision processes, but also the nonlinear optical properties of the system . The isotropic and anisotropic polarizability values of studied molecules are calculated (Table 1). These values show the smallest isotropic and anisotropic polarizability values for III-isomer. As expected from the principles of minimum energy (MEP), and minimum polarizability (MMP), that is, while a conformer changes from the most stable to other less stable species in most cases, the energy increases, and the polarizability increases[28-30]. The ionization potential (IP) and electron affinity (EA) are the well-defined properties that can be calculated by DFT to estimate electrons into the compounds. These values aim to get an in-detail rationalization of the relationship between the structure and the electronic behavior of the molecule, in particular the response of the molecule to the formation of a hole, or to the addition of an electron, additional information is derived. Table 2 contains the calculated IPs, EAs, both vertical and adiabatic, and the extraction potentials (HEP and EEP for the hole and electron, respectively) that refer to the geometry of the ions [31, 32]. The results, presented in Table 2, show that the IPa and IPv values in Si-doped gaphynes are less than graphyne. The most stable isomer of Si-doped gaphynes (III-isomer) has the lowest IPa and IPv values On the other hand, the EAa and EAv values in Si-doped gaphynes are more than graphyne. The most stable isomer of Si-doped gaphynes (III-isomer) has the most EAa and EAv values. Table 2. Dipole moment (m, Debye)), isotropic polarizability (aiso, Bohr3), anisotropic polarizability (aaniso, Bohr3), frontier orbital energies (a.u) and HOMO-LUMO gap (eV) of graphyne and Si-doped graphyne isomers in the M062X/6-311G(d,p) level of theory. The mobility of charges has been established to be related mainly to the internal reorganization energy λhole/electron. The data in Table 2 show that the λhole values for all molecules are all smaller than their corresponding λelectron values indicating that the electron transfer rate is lower than the hole transfer rate. According to the values gathered in Table 2, these molecules can be applied as hole transport layer (HTL)/an electron block layer. The dipole moments of ingarphyne andisomers of Si-doped graphynes are gathered in Table 1. As can be seen, the most stable isomer of Si-doped graphynes (III-isomer) has the largest dipole moment than that of other isomers. Table 1 summarizes the values of frontier orbital energies and HOMO-LUMO gaps. Apparently, HOMO is more stable in graphyne than Si-doped graphynes. In contrast, LUMO is more stable in Si-doped graphynes than graphyne. Table 3 shows the largest hardness and smallest electrophilicity for II-isomer. Table 3. Ionization potential (IP, in eV), electron affinity (EA, in eV), hole Extraction potential (HEP, eV), electron extraction potential (EEP, eV), reorganization energies (lhole,lelectron, eV) of graphyne and Si-doped graphyne isomers in the M062X/6-311G(d,p) level of theory. whereEg, s, kb and T are HOMO-LUMO gap, electrical conductivity, Boltzmann’s constant and T is the temperature, respectively. The HOMO-LUMO gap decreases from 2.69 eV in graphyne to 2.52-2.22 eV after Si-doping. According to the above mentioned equation, at a given temperature, the smaller HOMO-LUMO gap values are associated with more electrical conductivity. Figure 2 presents the plots of frontier orbitals of the studied molecules. It can be seen that these orbitals are p-type, and the overlap between carbon atoms of -CºC- is bonding and anti-bonding for HOMO and LUMO, respectively. Fig. 2. The plots of frontier orbitals in graphyne and Si-doped graphyne isomers. 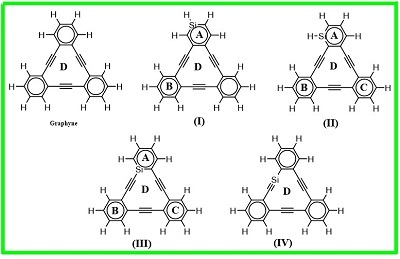 Figure 1 illustrates that graphyne involves aromatic 6-membered rings and the weak anti-aromatic 12-membered rings[38, 39]consisting of alternating triple bonds and conjugated double bonds, the latter being shared by the 6-membered rings. As benzene is regarded to be the smallest unit of graphite, dehydrobenzoannulene (1,DBA) can be considered as the smallest unit of graphyne. It is, therefore, of interest to illustrate changes of aromaticity in Si-doped graphynes. In an aromatic ring, a diatropic ring current rises which is the result of magnetic shielding at the ring center, however in an anti-aromatic ring, a paratropic ring current outcomes in deshielding at the ring center[41, 42]. Chemical shift nucleus independent values (NICS) values give a suitable and valuable quantity of the degree of aromaticity/anti-aromaticity of one ring in a molecule. Chemical shift nucleus independent values (NICS) values are calculated for the study of aromaticity in the investigated molecules. These values are gathered in Table 4. The calculated NICS values show the negative values for A, B, C cycles.These values are compatible with aromaticity of these rings. The most negative values in 1.5 Å which are above the rings reveal p-aromaticity in the rings. But, the positive values are observed for D cycle. Therefore, there is an anti-aromaticity in the D cycle. Table 4. Hardness (h, eV), chemical potential (m, eV) and electrophilicity (w, eV) values of of graphyne and Si-doped graphyne isomers in the M062X/6-311G(d,p) level of theory. An alternative scheme based on properties of the electron density, as the electron localization function (ELF) , has been introduced to understand aromaticity [45,46]. The electron delocalization can be obtained through the bifurcation analysis of ELF. The bifurcation points have been interpreted as a measure of the interaction among the different basins and, chemically, as a measure of electron delocalization . Table 5. NICS (in ppm) and ELF bifurcation values of rings for graphyne and Si-doped graphyne isomers in the M062X/6-311G(d,p) level of theory. The ELF values in the ring critical point (RCP) of six-membered rings are reported in Table 4. It can be found, high bifurcation values of ELF in the studied molecules. The ELF bifurcation values of the Si-doped graphyne are lower than that of garphyne molecule. This fact can be attributed to the electronegativity differences between carbon and silicon atoms. The comparison of energy values for four isomers of Si-doped graphyne shows that III-isomer is the most stable isomer. The internal reorganization energy values illustrate that these molecules can be applied as hole transport layer (HTL)/an electron block layer. The HOMO-LUMO gap values of the Si-doped graphynes are less than graphyne, therefore t can be seen as having more electrical conductivity in Si-doped graphynes. The NICS values of these studied molecules explore p-aromaticity in the A, B, C rings. In contrast, anti-aromaticity in the D cycle can be found. Smaller ELF bifurcation values of the Si-doped graphynein as compared to garphyne molecule are attributed to the electronegativity differences between carbon and silicon atoms. R.H. Baughman, H. Eckhardt, M. Kertesz, (1987) J. Chem. Phys. , 87, 6687-6699. T. Yoshimura, A. Inaba, M. Sonoda, K. Tahara, Y. Tobe, R.V. Williams, (2006) Org. Let., 8, 2933-2936. G.X. Li, Y.L. Li, H.B. Liu, Y.B. Guo, Y.J. Li, Z. D.B, (2012) Chem. Commun 46, 3256-3258. X. Qian, Z. Ning, Y. Li, H. Liu, C. Ouyang, Q. Chen, Y. Li, (2012) Dalton Trans, 41, 730-733. S. Wang, L.X. Yi, J.E. Halpert, X.Y. Lai, Y.Y. Liu, H.B. Cao, R.B. Yu, D. Wang, Y.L. Li, (2012) Small, 8, 265-271. F. Diederich, Y. Rubin, (1992) Angew. Chem. Int., Ed.Engl., 31, 1101. F. Diederich,(1994) Nature (London) 369, 199. E.A. Belenkov, I. Chelyab, (2002) Nauchn. Tsentra UrO Ross. Akad. Nauk, 14, 12. V.R. Coluci, S.F. Braga, S.B. Legoas, D.S. Galvao, R.H. Baughman, (2003) Phys. Rev. B: Condens. Matter, 68, 35430. A.N. Enyashin, A.A. Sofronov, Y.N. Makurin, A.L. Ivanovski, (2004) J. Mol. Struct. : THEOCHEM, 684, 29. V.R. Coluci, D.S. Galvao, R.H. Baughman, (2004) J. Chem. Phys., 121, 3228. V.R. Coluci, S.F. Braga, S.B. Legoas, D.S. Galvao, R.H. Baughman, (2004) Nanotechnology, 15, S142. C. Lepetit, C. Zou, R. Chauvin, (2006) J. Org. Chem. , 71, 6317. E.A. Belenkov, I.V. Shakhova, (2011) Phys. Solid State, 53, 2385. A.I. Podlivaev, L.A. Openov, (2012) Phys. Solid State 54, 1723. M.J. Frisch, G.W. Trucks, H.B. Schlegel, G.E. Scuseria, M.A. Robb, J.R. Cheeseman, G. Scalman, V. Barone, B. Mennucci, G.A. Petersson, H. Nakatsuji, M. Caricato, X. Li, H.P. Hratchian, A.F. Izmaylov, J. Bloino, G. Zheng, J.L. Sonnenberg, M. Hada, M. Ehara, K. Toyota, R. Fukuda, J. Hasegawa, M. Ishida, T. Nakajima, Y. Honda, O. Kitao, H. Nakai, T. Vreven, J.A. Montgomery, Jr., J.E. Peralta, F. Ogliaro, M. Bearpark, J.J. Heyd, E. Brothers, K.N. Kudin, V.N. Staroverov, R. Kobayashi, J. Normand, K. Raghavachari, A. Rendell, J.C. Burant, S.S. Iyengar, J. Tomasi, M. Cossi, N. Rega, J.M. Millam, M. Klene, J.E. Knox, J.B. Cross, V. Bakken, C. Adamo, J. Jaramillo, R. Gomperts, R.E. Stratmann, O. Yazyev, A.J. Austin, R. Cammi, C. Pomelli, J.W. Ochterski, R.L. Martin, K. Morokuma, V.G. Zakrzewski, G.A. Voth, P. Salvador, J.J. Dannenberg, S. Dapprich, A.D. Daniels, O. Farkas, J.B. Foresman, J.V. Ortiz, J. Cioslowski, D.J. Fox, in, Gaussian, Inc., Wallingford CT, )2009(. Y. Zhao, D.G. Truhla, (2006) J. Phys. Chem. A, 110, 5121-5129. M. Head-Gordon, J.A. Pople, M.J. Frisch, (1988) Chem. Phys. Lett., 153, 503-506. S. Saebø, J. Almlöf, (1989) Chem. Phys. Lett., 154, 83-89. M.J. Frisch, M. Head-Gordon, J.A. Pople, (1990) Chem. Phys. Lett., 166, 275-280. M.J. Frisch, M. Head-Gordon, J.A. Pople, Chem. Phys. Lett., 166, 281-289 (1990). M. Head-Gordon, T. Head-Gordon, (1994) Chem. Phys. Lett., 220, 122-128. S. Grimme, (2006) J. Comput. Chem. , 27, 1787-1799. J.D. Chai, M. Head-Gordon, Phys. Chem. (2008) Chem. Phys. , 10, 6615-6620. K. Wolinski, J.F. Hinton, P. Pulay, (1990) J. Am. Chem. Soc, 112, 8251–8260. T.Lu, F. Chen, (2012) J. Mol.Graphics. Model, 38, 314. V. Librando, A. Alparone, Z. Minniti, (2008) Journal of Molecular Structure: THEOCHEM, 856, 105. P.K. Chattaraj, P. Fuentealba, B. Gomez, R. Contreras, (2000) J. Am. Chem. Soc, 122, 348. P.K. Chattaraj, S. Sengupta, (1996) J. Phys. Chem. A, 100, 16126. T.K. Ghanty, S.K. Ghosh, (1996) J. Phys. Chem. A, 100, 12295. A. Curioni, M. Boero, W. Andreoni, (1998) Chem Phys Lett 294, 263–271. I. Wang, E. Botzung-Appert, O.S.p. O, A. Ibanez, P.L. Baldeck, (2002) J Opt A Pure Appl Opt 4,S258–S260. R.G. Pearson, Chemical Hardness, Wiley-VCH: Oxford, )1997(. R.G. Parr, W. Yang, Density-Functional Theory of Atoms and Molecules, Oxford University Press: New York, )1989(. R.G. Parr, L.v. Szentpály, S.Liu, (1999) J. Am. Chem. Soc, 121, . R.G. Pearson, (1986) Proc. Natl. Acad. Sci., 83, 8440‐8441. S. Li, Semiconductor Physical Electronic, 2nd ed ed., Springer, USA, )2006(. K.B. Wiberg, Chem. ReV. , 101, 1317-1331 (2001). E.L. Spitler, C.A. Johnson, M.M. Haley, (2006) Chem. ReV. , 106, 5344-5386. H.A. Staab, F. Graf, (1966) Tetrahedron Lett, 7, 751-757. L. Pauling, (1936) J. Chem. Phys., 4, 673-677. J.A. Pople, K.G. Untch, J. Am. Chem. Soc. , 88, 4811-4815 (1966). Z. Chen, C.S. Wannere, C. Corminboeuf, R. Puchta, P.v.R. Schleyer, (2005) Chem. Rev. , 105, 3842-3888. A. Becke, K. Edgecombe, (1990) J. Chem. Phys. , 92, 5397. A. Savin, A. Becke, D. Flad, R. Nesper, H. Preuss, H.V. Schnering, (1991) Angew. Chem., Int. Ed. Engl., 30, 409. J.C. Santos, W. Tiznado, R. Contreras, P. Fuentealba, (2004) J. Chem. Phys., 120, 1670. How to cite this manuscript: Reza Ghiasi*, Faegheh Aghazadeh Kozeh Kanani. Theoretical insights of the electronic structures, conductivity, and aromaticiy of graphyne and Si-doped graphynes. 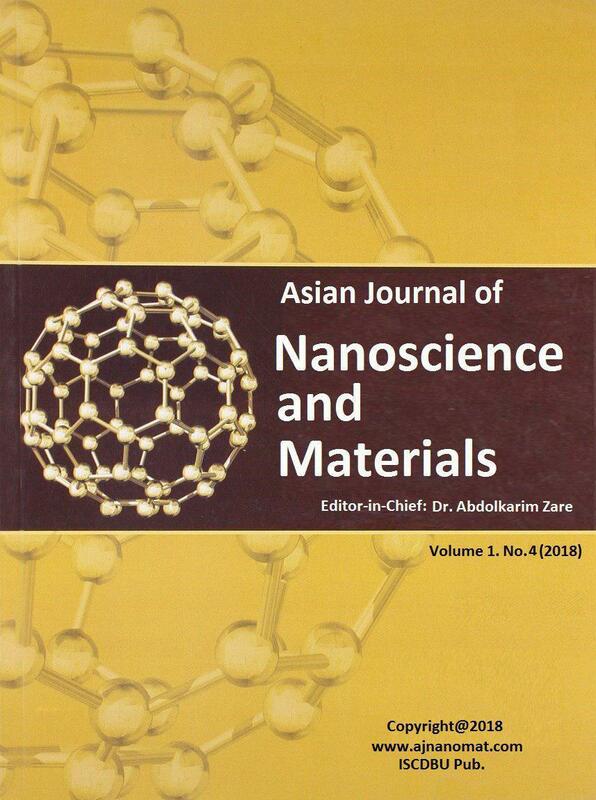 Asian Journal of Nanoscience and Materials, 2018, 1 (4), 234-243.